It has been a long time coming, but NASA has successfully installed the first mirror onto the agency’s new James Webb Space Telescope. The announcement that the first of 18 flight mirrors had been put into place was made via a release issued by NASA on Wednesday, Nov. 25, and highlighted that the observatory was approaching its launch date in 2018. 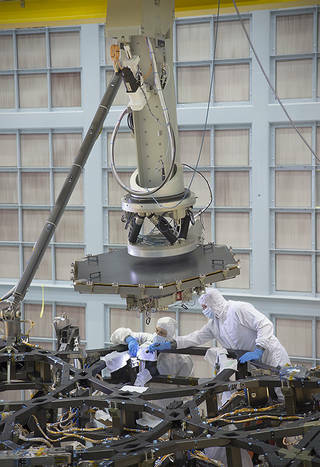 Engineers used a robotic lift arm to maneuver the mirror into place at NASA’s Goddard Space Flight Center located in Greenbelt, Maryland this week. Each of the mirrors measures slightly more than 4.2 feet (1.3 meters) across and weighs approximately 88 pounds (40 kilograms). When the separate mirrors are in place and working as one unit, they will measure an expansive 21.3 feet (6.5 meters) across. NASA hopes that the installation of the individual mirrors will be completed by early next year. If everything goes according to plan, the JWST will be launched from Kourou, French Guiana, on an Ariane 5 rocket. While the JWST is frequently described as a replacement for the Hubble Space Telescope, which has been on orbit for 25 years, it is more accurate to describe the JWST as a successor to Hubble. Whereas Hubble is capable of viewing its targets in the near ultraviolet, visible, and near-infrared spectra, the JWST will work in long-wavelength visible to the mid-infrared. Like a piece of techno-origami, the 18 segments will unfold and adjust their shape after the JWST has been sent aloft. The mirrors are composed of beryllium. The ultra-lightweight material was tapped due to its thermal and mechanical properties at the cryogenic temperatures it will encounter at the Earth-Sun L2 point. To aid in the space-based observatory’s infrared detection capabilities, each of the segments will be coated in a thin layer of gold coating which will reflect infrared light. The JWST’s largest element is a five-layer Sunshield about the size of a tennis court and will work to attenuate the heat coming from the Sun by more than a million times. For the telescope to function properly, the mirrors must be precisely aligned – a difficult task considering the environment that the telescope will be in. When it arrives at its permanent destination, it will encounter temperatures between –406 °F (–243.3 °C) and –343 °F (–208.3 °C). The telescope’s backplane cannot move more than 38 nanometers (about one-thousandth the diameter of a single human hair). For those working on the project, the stresses involved with ensuring that the spacecraft meets the stringent requirements placed on it is matched by the milestones the team constructing the telescope. The JWST’s mirrors are produced by Ball Aerospace & Technologies Corp., headquartered in Boulder, Colorado. Ball is a subcontractor to Northrop Grumman who is tasked with producing the optical technology and lightweight mirror system. Harris Corporation has been selected to install the mirrors onto the telescope’s structure (Harris is also responsible for integration and testing for the JWST). While U.S. corporations might be currently taking point in the spacecraft’s assembly, the JWST is most certainly an international affair. Besides NASA, the European Space Agency (ESA) and Canadian Space Agency (CSA) are partners on the project. The JWST has had a tumultuous development and production phase, with the United States House of Representatives voting to end funding of the project. However, with an estimated $3 billion already spent and 75 percent of its hardware produced, the JWST was saved via a compromise. As noted in an article by Dan Leone appearing on Space.com, the telescope, at present, has cost some $8.8 billion.